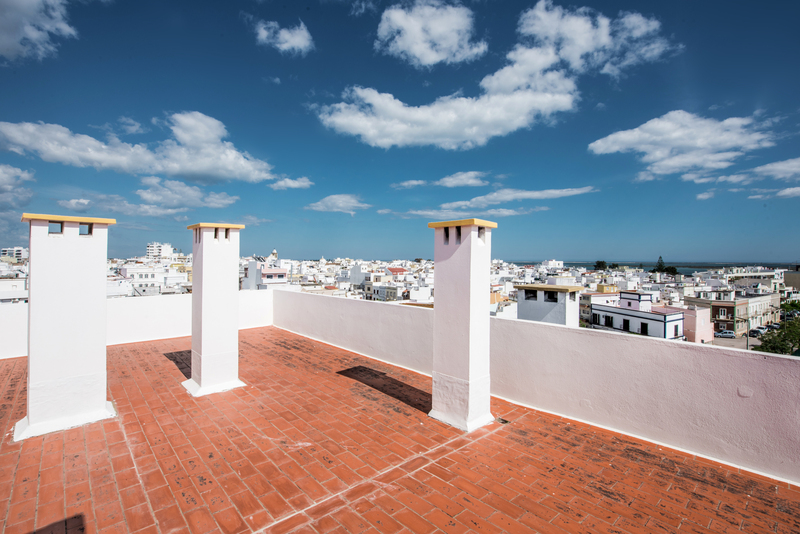 Newly renovated and furnished 2 bedroom apartment in the heart of Olhao with a large shared roof terrace. Facilities include air conditioning and wifi. 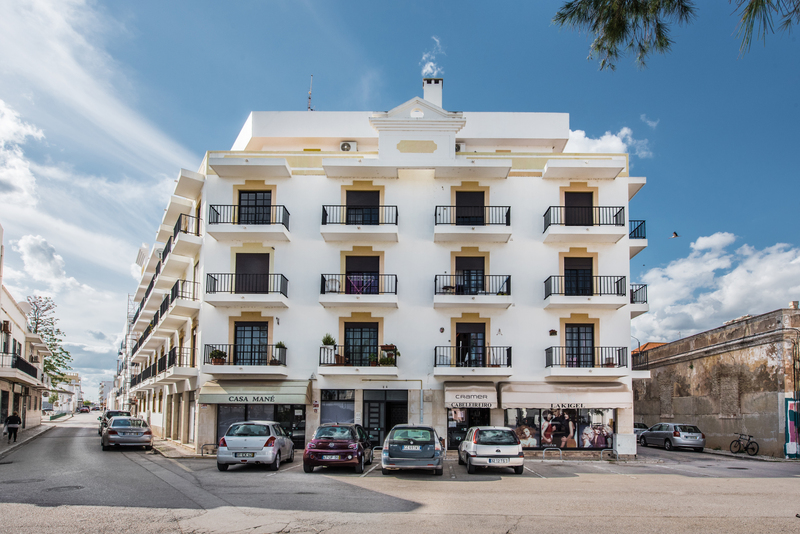 Apartment Girassol is a beautifully furnished 2 bedroom apartment at second floor level in a small block of apartments close to the sea front of Olhao. Our 2 bedroom apartment as accessed from a quiet street via a communal entrance with intercom facilities. The communal front door open to a shared vestibule and directly in front you will find stairs that lead to the apartments. Apartment Girrasol is located at 2nd floor level so you will need to climb 2 sets of stairs. On the second floor is 3 apartments and our 2 bedroom apartment is to the right. A super solid front door with a double lock opens up straight into this 2 bedroom apartment. 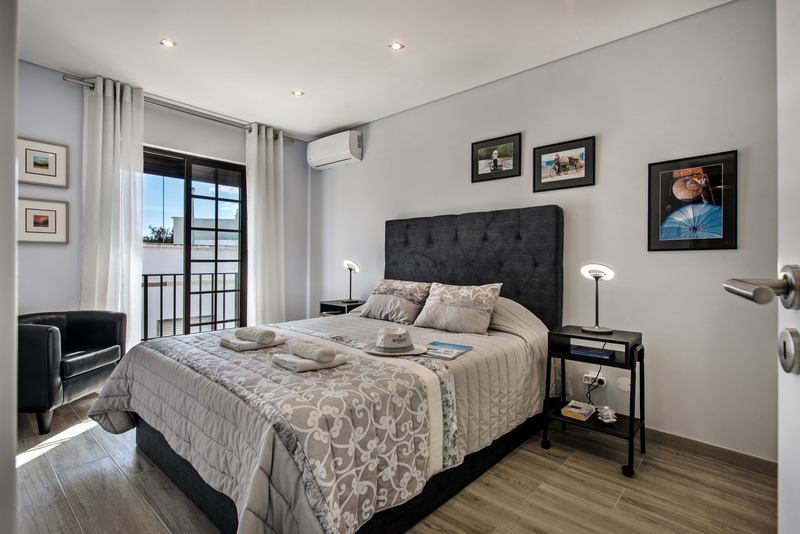 A wonderful and ultra modern lacquer black brick style wall faces you as you enter the 2 bedroom apartment and sets the very modern scene for Apartment Girassol. To the left of the front door the 2 bedroom apartment open up into the living space. Dual aspect french windows provide an abundance of natural light to the room and allow access to 2 small Juliet style balconies. The windows are complimented with shutters mainly to keep out the hot sun in the summer months. But also great to keep a darker room at night. the windows are double glazed too to keep out any street noise form below, although Apartment Girassol is in a lovey quiet part of the Town. 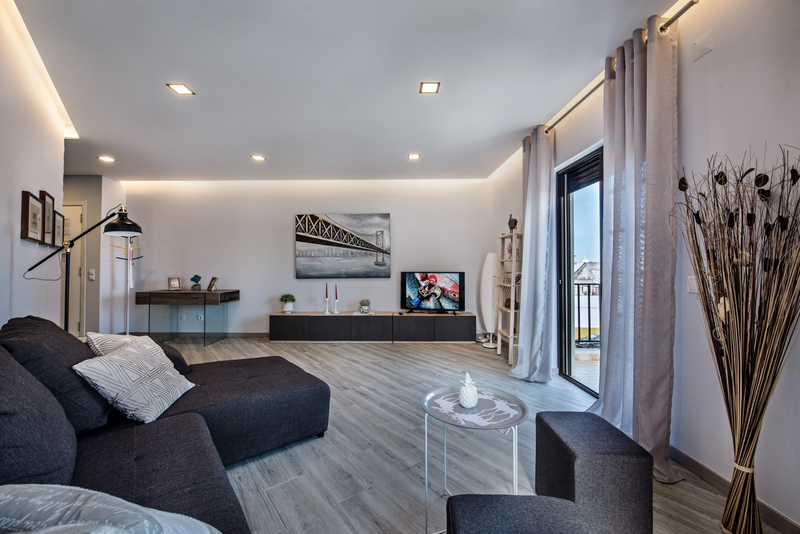 The flooring is laminate and styled in a grey lighter wood colour to offer a touch of polish to the room, the floating ceiling has spotlights inset and the white wall give the room an exceptionally modern and chic feeling. The living space is furnished with a lovely large grey fabric corner unit style sofa and the sideboards and coffee tables are designed to match the sofa and colourings of the room. A flat screen Smart television sits upon a modern low set tv cabinet that almost runs the length of the room. Its is adorned with sea theme and modern ornaments. The television offers a selection of European channels to try and suit every taste. 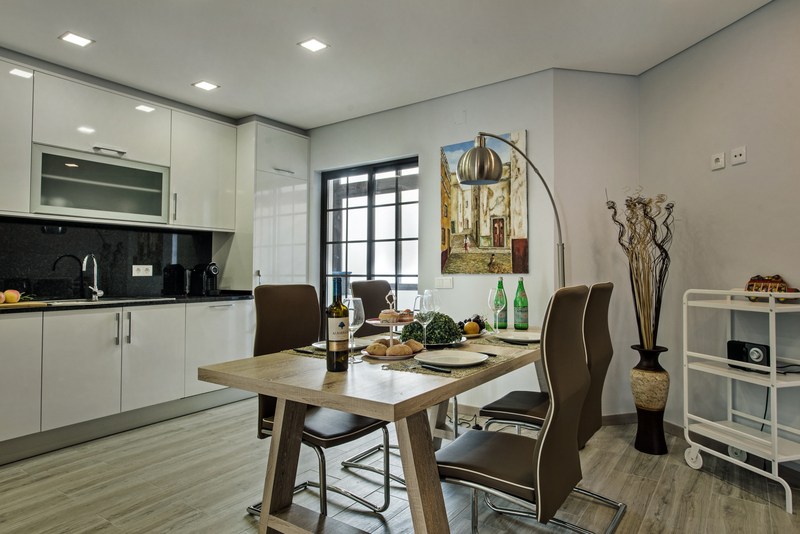 Here you will also find the WIFI unit and it provided great internet throughout the 2 bedroom apartment. Where ver you look you will find pleasant decorations and wall mounted picture to add a touch of comfort and hoe feeling to the room. An air conditioning unit has been installed to offer lovely fresh cool in the hot summer months. But also the unit is perfect to add a touch of warmth in the cooler Winter evenings. Our 2 bedroom City centre apartment is a superb choice for a holiday base any time of the year. To the right of the 2 bedroom apartment front door is the large open plan kitchen and diner. A large wooden dining table and 4 very modern design brown leather and chrome chairs surround the table. A great place to sit and enjoy meals but also to keep the cook company during a pleasant evening with family or friends. An ultra modern curved free standing lamp hangs over the table to give a lovely ambient light to the table. 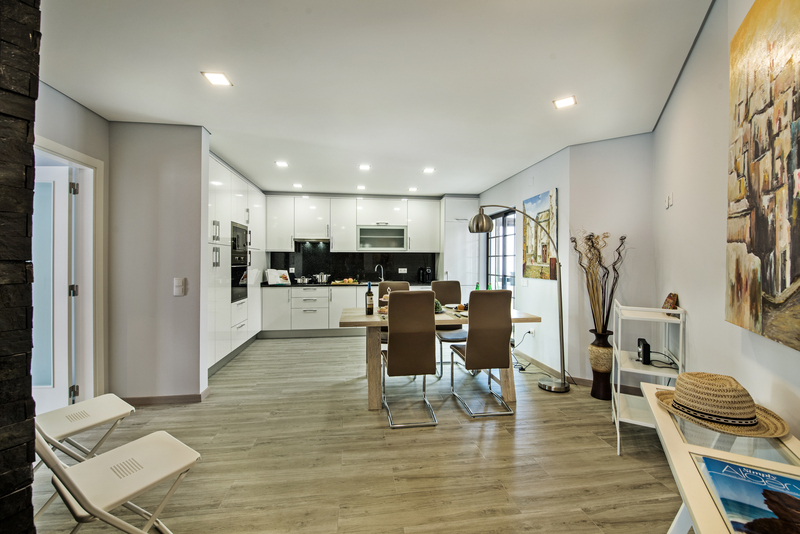 Matching the rest of the 2 bedroom apartment warm laminate flooring offers a clean and practical solution. The floating ceiling has the super modern spotlighting and offers great light over the kitchen surfaces. 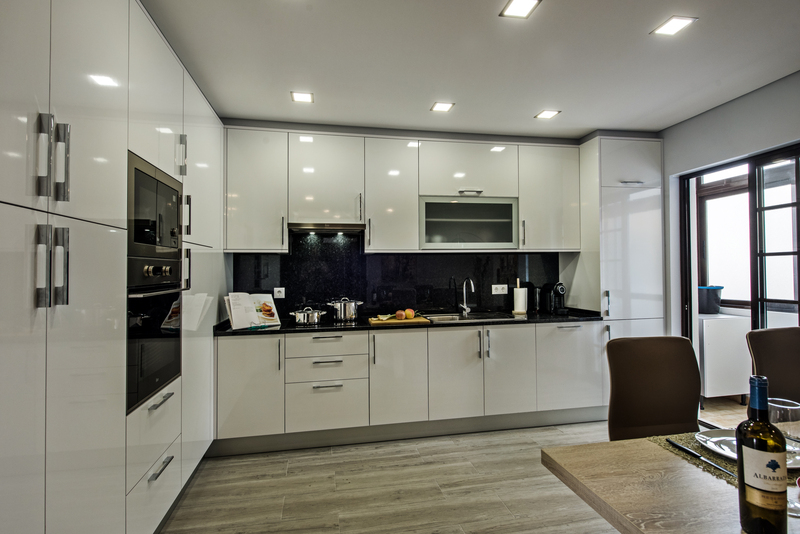 Along 2 wall of the kitchen in our 2 bedroom apartment is a beautifully fitted kitchen in modern white and grey with chrome fittings. 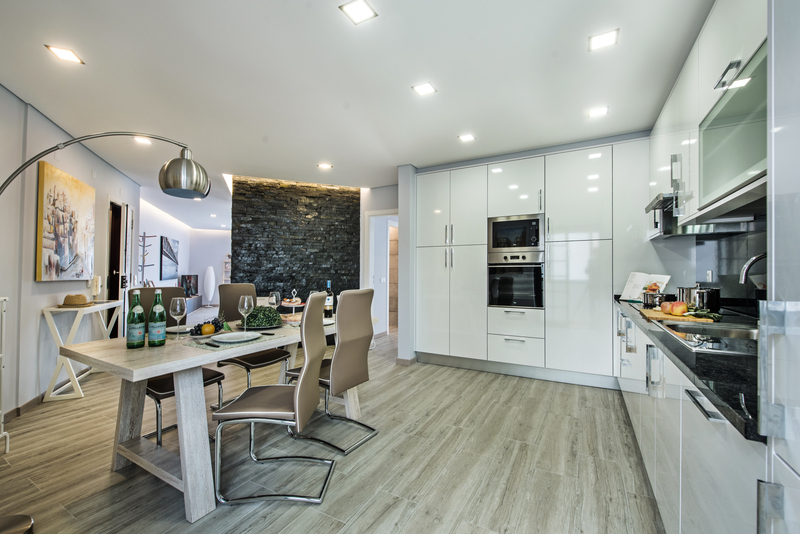 It is ultra modern and fitted with integrated units to include a full size fridge freezer, dishwasher, electric hob, microwave and oven. The kitchen offers an abundance of storage space in the cupboards and drawers. The kitchen has been kitted out with plenty of cooking pots and pans, cooking utensils, serving dishes, plates, bowls, cups, mugs glasses and much more. The drawers are filled with tea towels, oven gloves some cooking items, cutlery and small useful items. We have also provided a capsule coffee machine, kettle and toaster. These all can be found on the large black marble work surfaces, behind which is modern black splash backs. To the right of the kitchen is sliding doors that lead to a small enclosed terrace that overlooks the central area of the blocks of apartments. This terrace is used as a very useful utility room. It houses a washing machine, iron and ironing board plus some cleaning tools. From the kitchen an modern white and glass door lead to a small central hallway. From this hallway are the bedrooms and bathroom. To the right is the master bedroom. A huge and very comfortable king size bed with a handsome headboard set with quilted buttons and in a dark grey lavish fabric dominates the room creating a stunning and opulent room to enjoy. Each side of the bed are small black bedside tables both with matching modern bedside lamps. A bucket chair sits in the corner of the room. 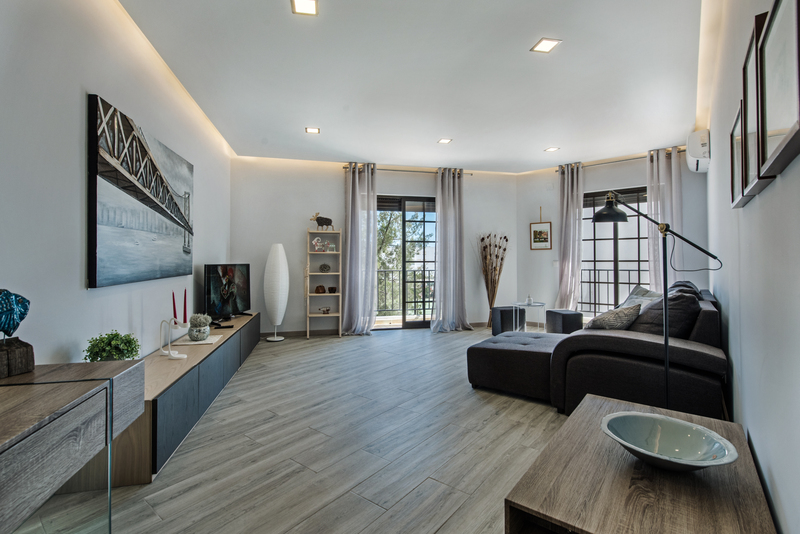 Again the laminate floor offers style and comfort and the floating ceiling is set with spot lamps keeping that lovely modern feeling. The walls have been decorated in a delicate grey and gives a real feeling of grace to the room. An air conditioning unit offers fresh cool breezes in the summer months and a warm flow of comfort in the cooler winter months. A double glazed set of French windows offer a great way of brining cool air and light in to the bedroom of our 2 bedroom apartment and a small Juliet balcony allows you to enjoy the city views. The windows are decorated with light fabric white flowing curtains. In the centre of the hallway is a smaller bedroom that can be used as a twin room. Two fold down chairs make great single beds most suitable for children. Huge fitted glass, mirror and white wardrobes offer plenty of hanging and storage space. An air conditioning unit offers the usual comfort any time of the year. French windows with double gazing provide light and a cool breeze. 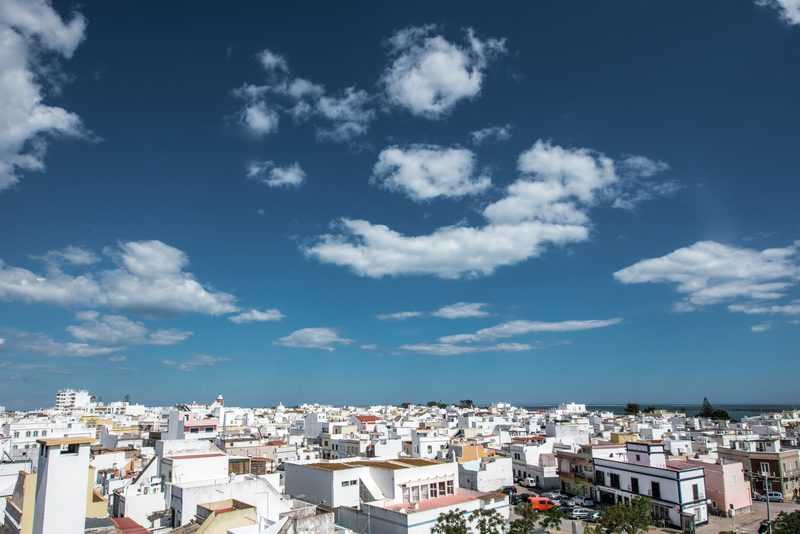 They look out onto the city view and face on to a nice quiet street right in the heart of Olhao Town centre. Huge mustard below curtains surround the windows and a bean bag and rug add warmth and structure to the room. To the left of the hall is the bathroom. Ultra modern in design and fitted with up to date and chic fittings. 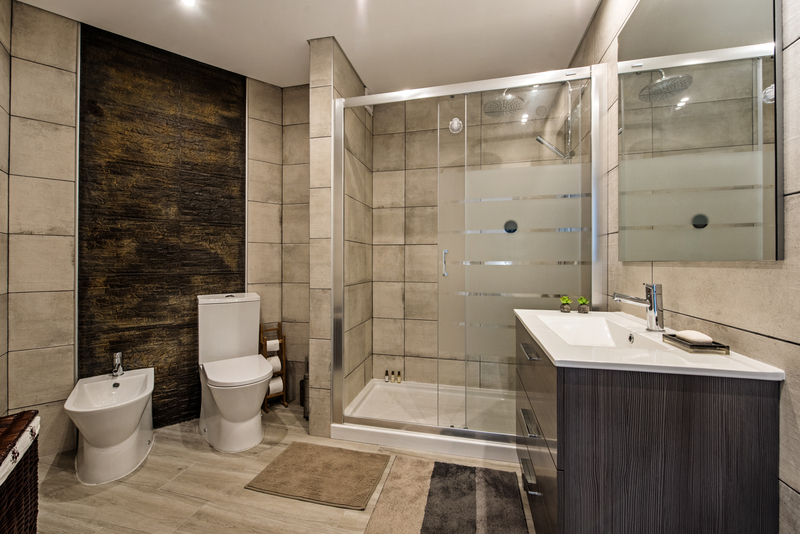 The bathroom in our 2 bedroom apartment presents you with a wonderful and huge walk in shower cubicle with glass sliding doors. The rainforest head provides an nice powerful rain of warm water for you to enjoy. A modern dark wood style vanity unit has a large white ceramic basin set in to the top and provides lots of storage is the cupboards below. here you will find a hair dryer for your use during your stay. Above is a large modern mirror. The bathroom has a bidet and toilet. The walls are styled with a chocolate and hazel nut brown two tone effect in a very chic and modern style. Both bedrooms have the beds made with crips white freshly laundered linen along with hand and bath towels. We also offer beach towels to save on luggage weight for you! 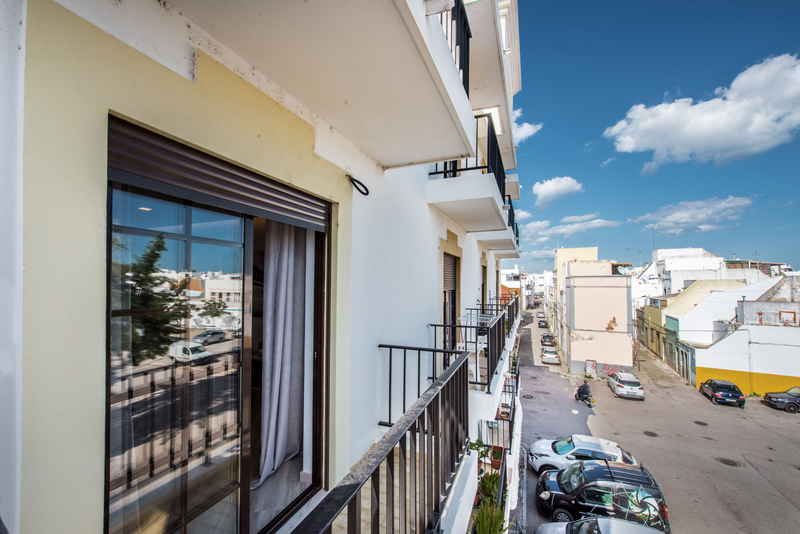 Apartment Girassol has small balconies that overlook the town from the living area and bedrooms. These offer light and fresh air to the rooms. Another small enclosed terrace in the kitchen is used an a utility room. 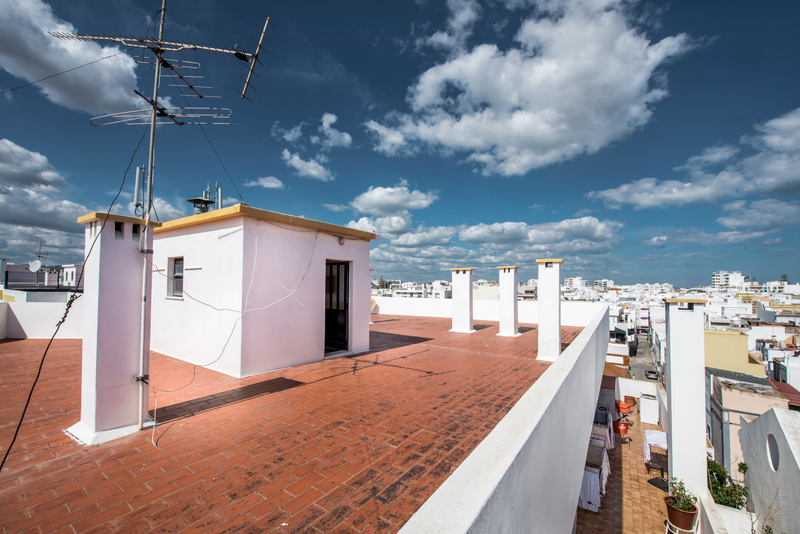 Our 2 bedroom apartment does have access to a super large roof terrace shared by al the apartments in the building. It is reached by climbing 3 sets of stairs and via a locked door. 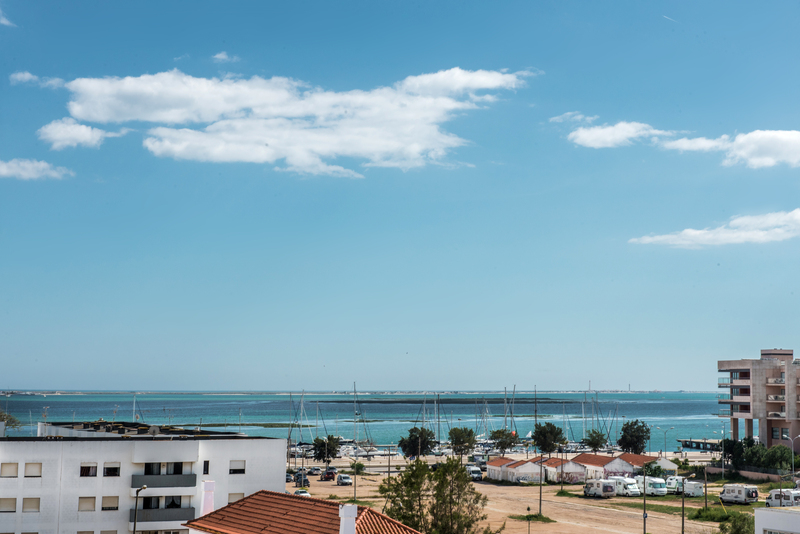 It provides fantastic views across the sea and Ria Formosa lagoons. 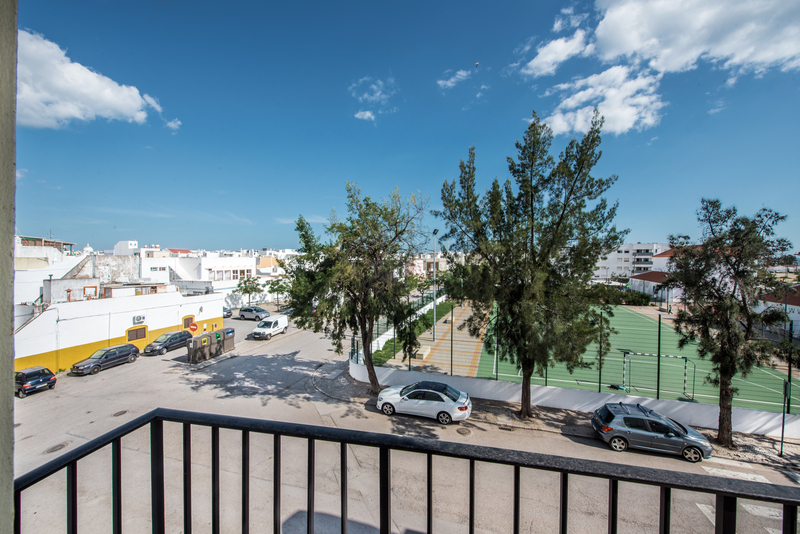 Apartment Girassol is in a great location if you don't want to hire a car and everything is in such easy walking distance including the bus and train stations. The boats for the islands beaches are close by. 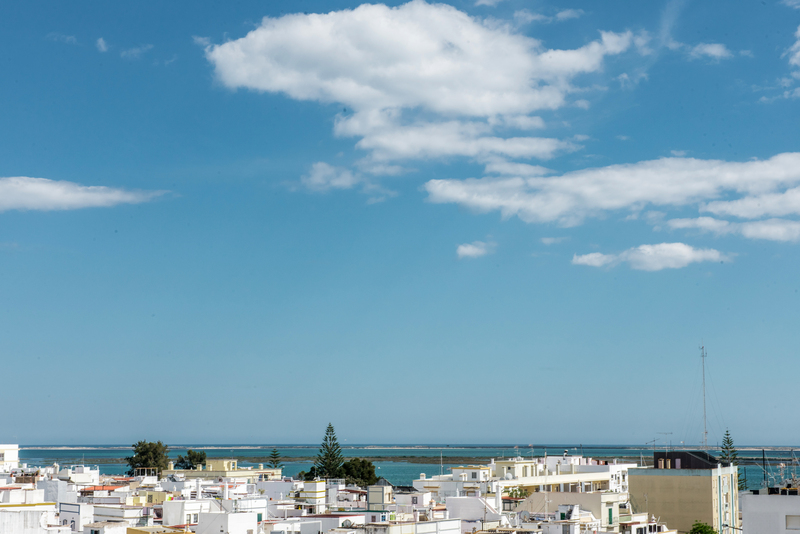 A wonderful walk along the promenade and sea front to the daily markets is easy and very accessible from Apartment Girassol. 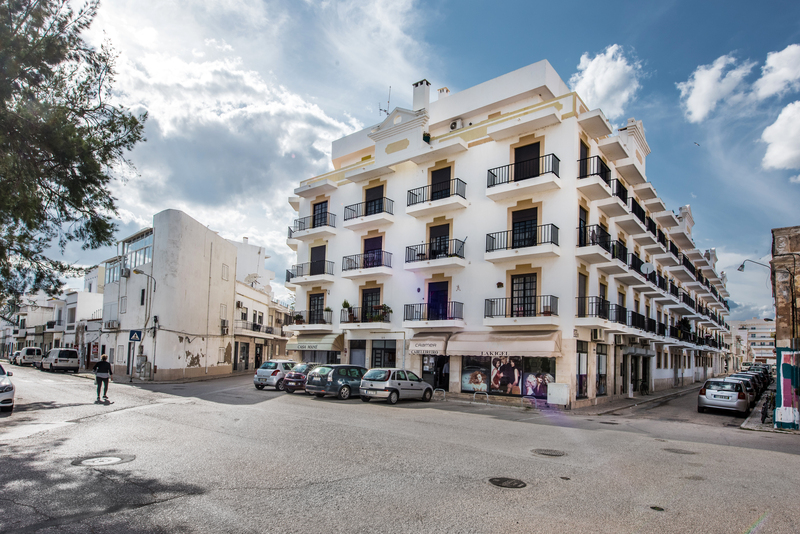 Being newly renovated in 2018 it offers the most up to date furnishings and decorations in an older style, City centre apartment block. 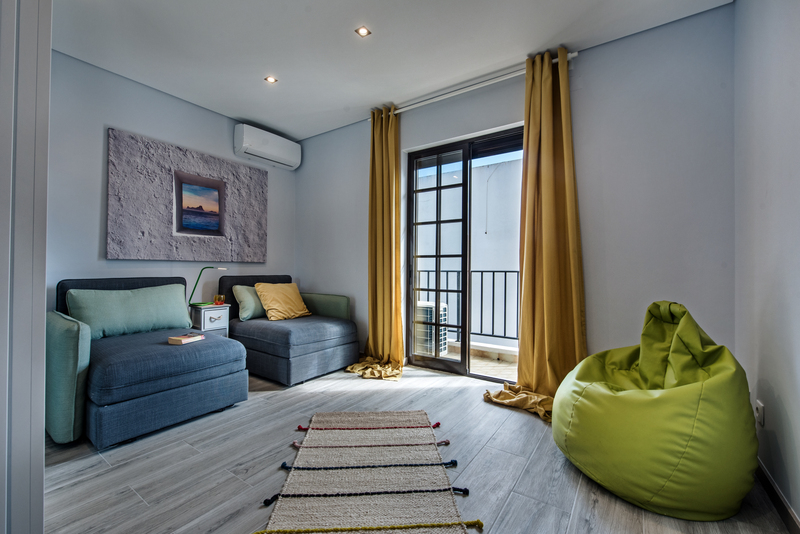 In essence this apartment give you modern and easy living but within the fabulous and eclectic town centre of Olhao. Thus providing you with a real and authentic holiday experience. Our lovely 2 bedroom apartment comes with its own manual that you can download to your tablet or smart phone. Packed full of information to make the best of your holiday starting from the moment you arrive. It tells you how to collect the keys, who will look after you during your stay and clear concise directions to Apartment Girassol. Then it is packed full with details of the best restaurants, taxis and local amenities and activities. "Thank you very much for your hospitality and having created great experience for us. “Wir sind absolut zufrieden mit dieser Unterkunft gewesen und hatten tolle Tage in Olhao. Aline hat den Check-in mit uns gemacht, war sehr freundlich und stand für Fragen zur Verfügung. Die Wohnung ist super ausgestattet: Klimaanlage, elektrische Jalousien, sehr gut ausgestattete Küche und Waschmaschine. Es war sehr heiß während unseres Urlaubes und wir freuten uns nach unseren Ausflügen immer über die angenehm klimatisierten Räume. Wir haben hier richtig gut geschlafen. Die Lage ist perfekt: Man braucht in die Altstadt fußläufig 5-10 Minuten, auch zur Uferpromenade ist es nicht weit und wir fühlten uns jederzeit sicher. Eine Bäckerei, eine Tapas-Bar und eine Bushaltestelle befinden sich in Sichtweite der Wohnung. Als Familie mit einem 15 Monate altem Kind, war das ideal, da die Wege kurz waren. Mit dem Auto ist man in 15 Minuten am Strand von Fuseta, mit der Fähre sind wir nach Armona gefahren (Fahrplan beachten, ca. 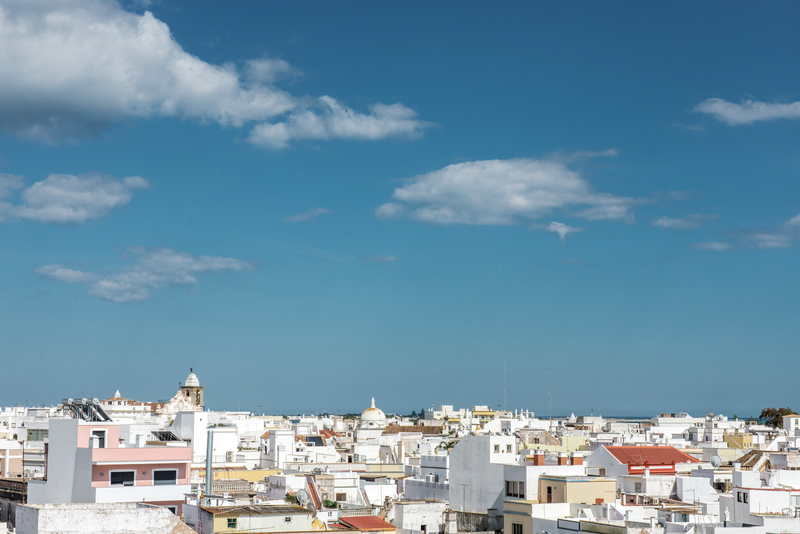 15 Minuten Überfahrt), 30 Minuten Autofahrt dauert es nach Tavira bzw. zum Praia do Barril. Olhao an sich ist aber schon interessant, weil man hier das portugiesische Kleinstadtleben authentisch miterleben kann. Den Markt am Samstag sollte man auch unbedingt besuchen. Am besten früh morgens. Dann ist es nicht so heiß und man kann die Einheimischen am besten bei ihren Einkäufen beobachten. Wir würden diese Unterkunft auf jeden Fall noch einmal buchen. ” “We were really satisfied with the apartment and your service.